For The Love Of Valentines! Hope all is well with you & yours! It is raining here & the forecast says it will be getting colder (we JUST seemed to thaw out from all the ice!) & snow is in the forecast... Brrrr! 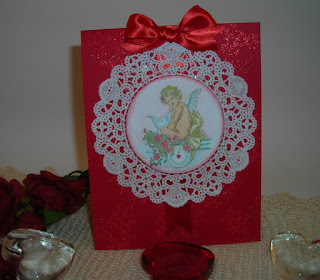 But, LOVE IS IN THE AIR, with Valentines on the way! Are you ready for VALENTINES DAY? This is one "holiday" I LOOOOVE to celebrate! Who doesn't love to be told they're loved? It isn't far away so, I thought I better get a move on it & get these done & thought you might like to see too! Take a look! Inside verse: "I Love You!" 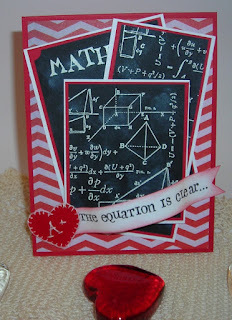 This one is for our Mathematician! I just HAD TO try the chalk-board technique that is all the rage right now! 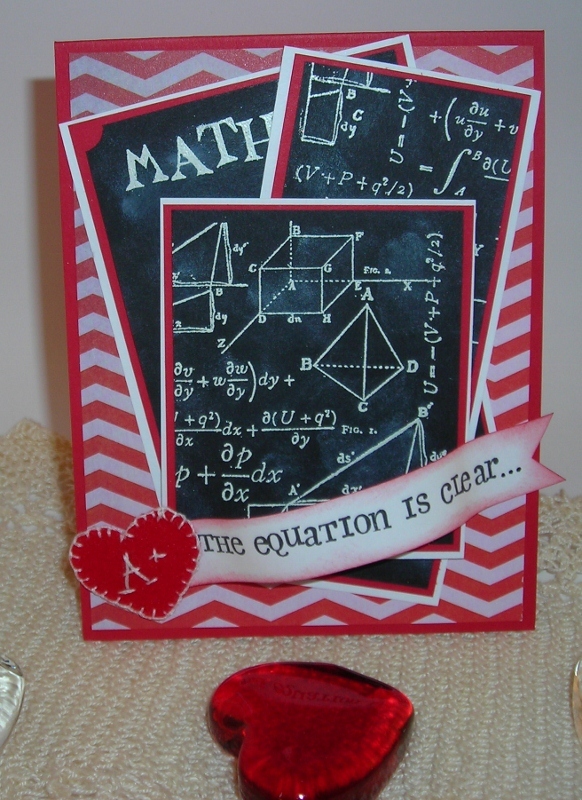 AND use some Chevron paper too! Inside verse- "My Heart, over & over!" AND I've been wanting to use Vintage Bingo cards too! This one, I just wanted to make it SWEET! I also HAD TO make one of my Stand-Up Cards too! 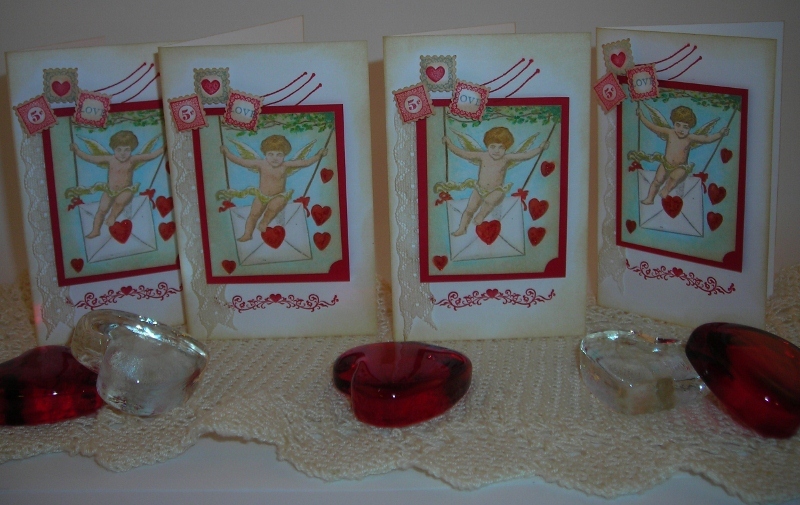 AND I even have something special you can make for those special someone(s) in your life! This very Ornament is the thing that got me into serious stamping years ago! 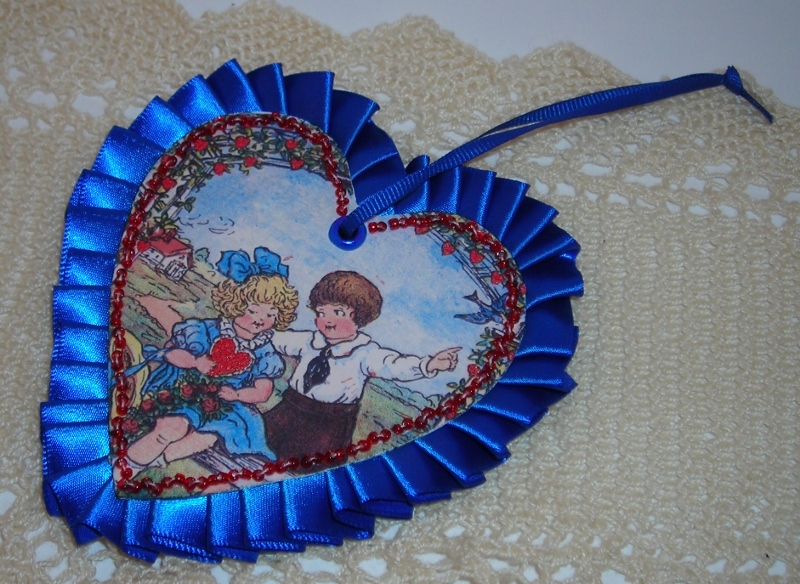 I created this little ornament for my friends & sent them for Valentines one year. 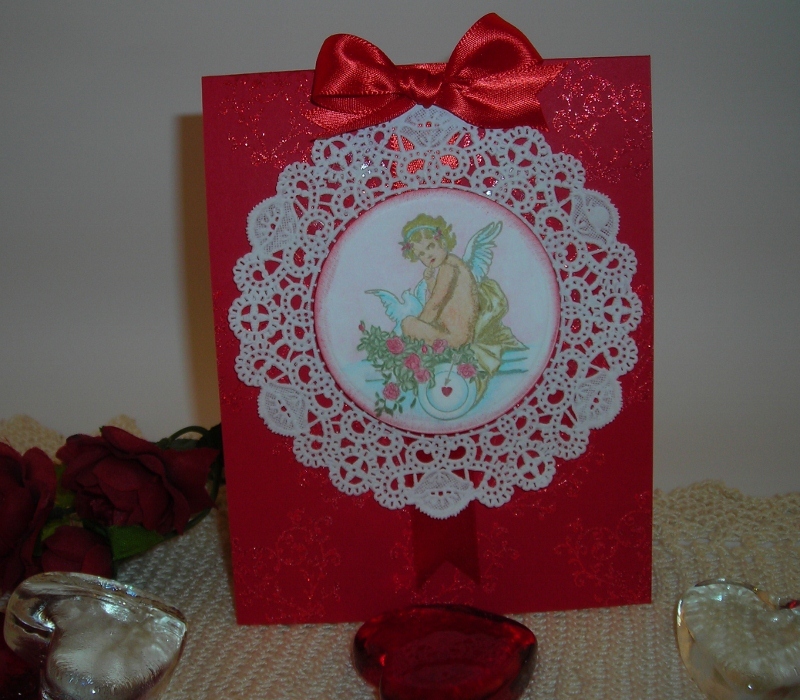 For my family, I made them some too & hung them on the back of our dinning room chairs with a large netting bow, when I created a special Valentine Tea! 1) Start by finding a die or something you can cut a HEART SHAPE from. I like the Fiskars Template, (Orange Plastic- you can find them at Hobby Lobby & Michaels! ) 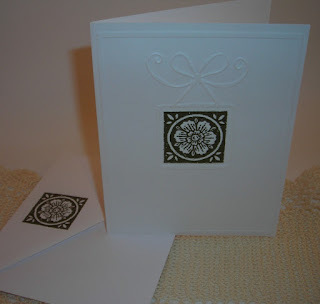 Using the My Safe Cutter by Fiskars. 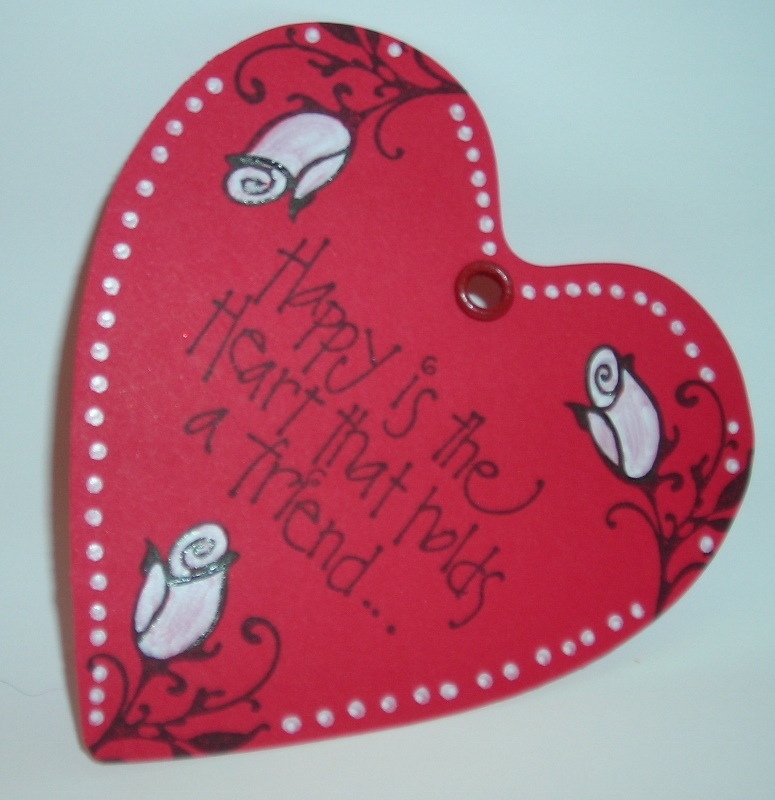 The heart is a little rounder than the Spellbinders. You can get more of the image you use with the Fiskars Template. There are all different kinds of Valentines out there for Free of charge too! 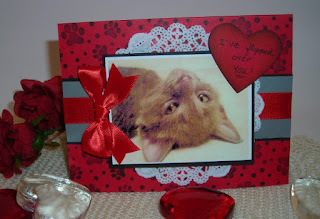 3) COPY YOUR IMAGE onto card stock & CUT YOUR IMAGE out using the heart shape you chose. Add any embossing powder for an extra special touch at this point, emphasizing what you want emphasized, Hearts, gold lines etc.! 4) You will need ANOTHER HEART SHAPE IDENTICAL IN SIZE. 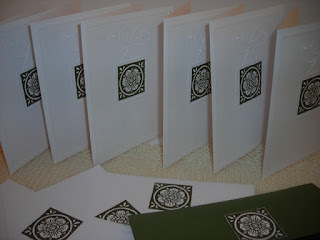 I usually use a different color or patterned paper. Make sure you use a heavier card stock or equal to what you used for the front piece. 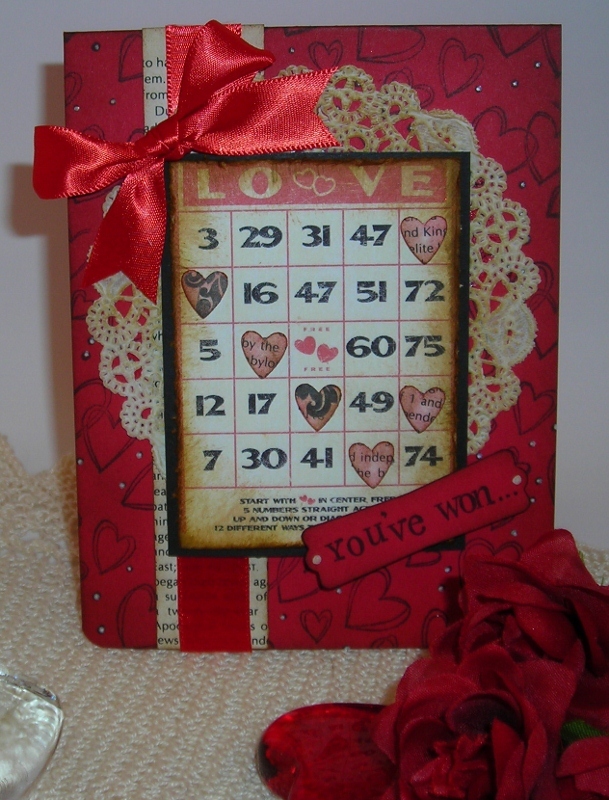 DECORATE this piece using smaller stamps. 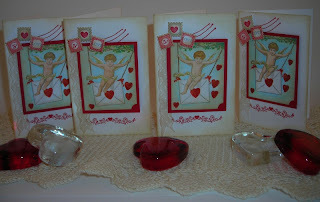 You can stamp "Happy Valentines," a verse, or someones name. This is the back of my ornament. 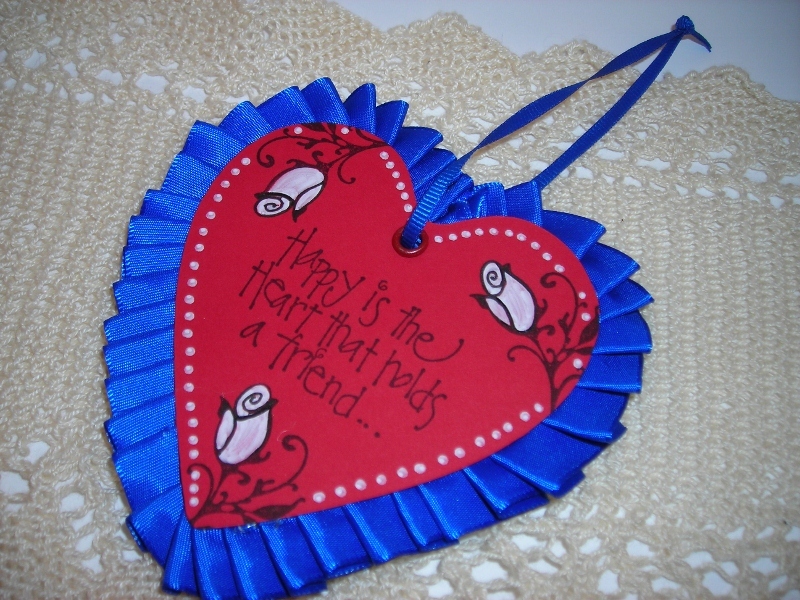 6) PAPER PIERCE all around the front heart edge, right up to the grommet. 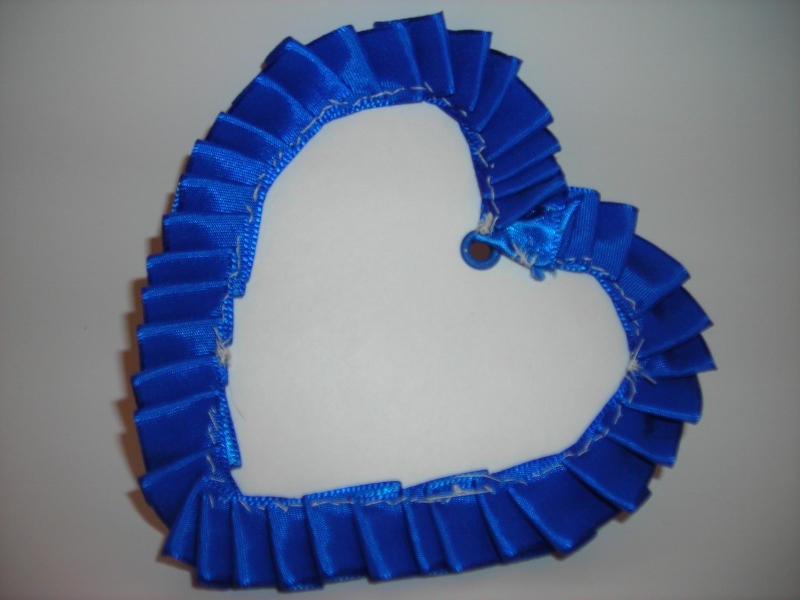 7) Using SEED BEADS & RIBBON-5/8", sew the ribbon & seed beads onto the front heart/image. I sew on the ribbon, pleating it as I go, then come back through those same holes & sew on your seed beads. I use two beads per stitch. (This is the longest part of this project.) Make sure as you sew that your threads are pulled tight or your seed beads will sag! Just roll them around under your fingers, untwisting the thread at times. This is how the back of the front heart/image will look when you're done. 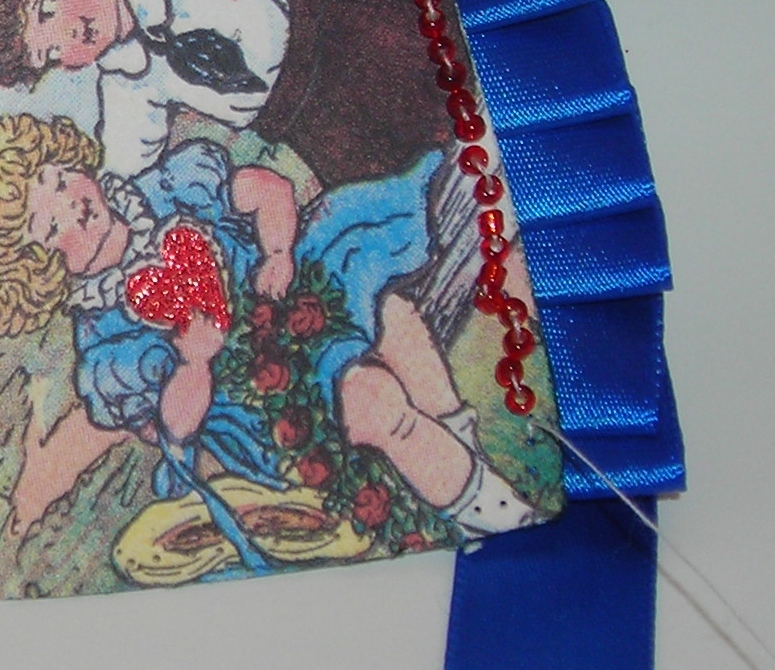 Be careful not to cover the hole with ribbon & keep your stitching to the inner edge of the ribbon. 8) Using a HOT GLUE GUN, line up the hearts (front & back) by the grommet placements. Tucking in any loose threads, glue just a little at the top of the heart; place the back heart on lining up the grommets, (making SURE that the grommets stay open!) Making sure you'll be able to cover the stitching, gluing only a little bit at a time & pressing it down. Work your way around taking your time! You can always go back & pull off those strings of glue that form. 9) Using a THINNER RIBBON--1/8" to match the larger ribbon, here I used grosgrain ribbon, string the ribbon through the grommets & tie off the end. 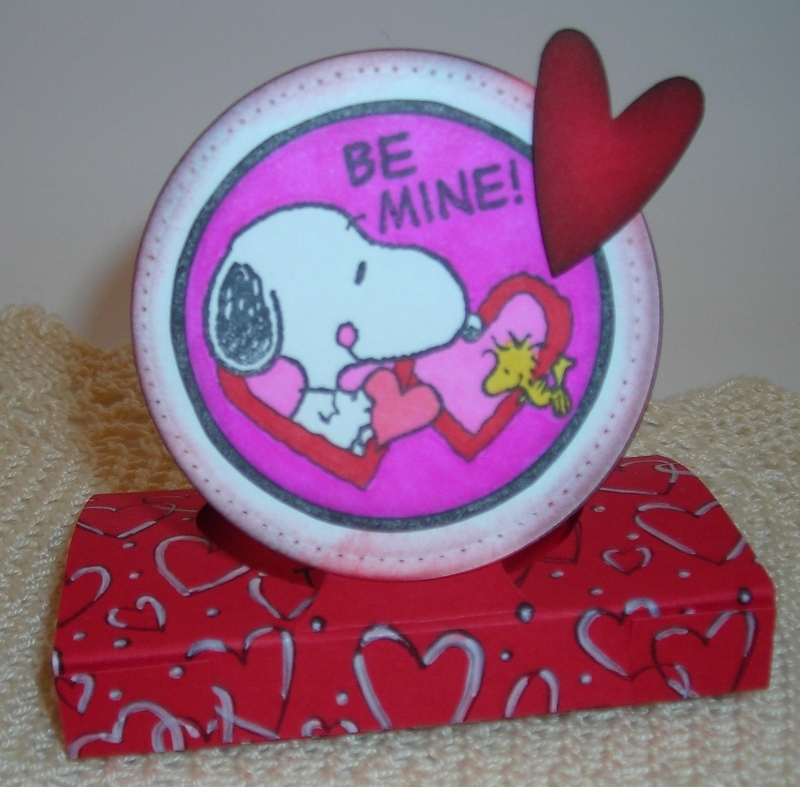 Don't forget to sign your name on the edge of the back so the recipient will remember who this little Valentine is from! I also like to put the year too! Felt heart- I made that & embroidered it! Hope this inspires you if you haven't begun your Valentines! "Beloved, let us love one another: for love is of God; & every one that loveth is born of God, & knoweth God. He that loveth not knoweth not God; for God is love." 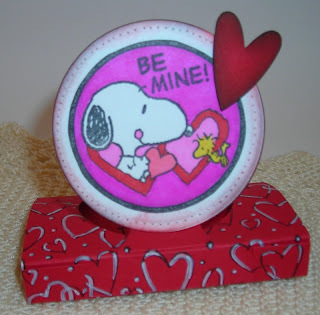 Sending VALENTINE HUGS your way! Maybe, you've been WONDERING where I've been???? With the holidays & our son being home from college I thought it a GOOD TIME to take a little break & just enjoy the family! With the New Year, some of you may have made "New Years Resolutions?" I don't like to call my GOALS "New Years Resolutions" but, I do see the New Year as a time of the year to REFLECT! My heart has been telling me to go in another direction here lately. As a Christian, I have been feeling a tug at my heart to do more Bible Study & every day the feeling just gets stronger! Little "reminders" or promptings keep popping up! And having the feeling of needing to be involved LOCALLY to touch others! "One thing have I desired of the Lord, that will I seek after;"
What is YOUR ONE DESIRE? What is THE ONE THING that you will seek after in this New Year? For me, my ONE DESIRE for the New Year is to become more knowledgeable in the things of God, that I can help others, that I will be more pleasing to God. With Homeschooling, I can pick & choose our childs curriculum. Of course, you have guidelines to follow, but you can create your own curriculum too! Some Homeschoolers do it ALL from scratch! I'm NOT one of those! I figure, if the curriculum is there & it's GOOD curriculum, teaching core values you want your child to learn, then GO WITH IT! But, I LIKE the idea of ADDING TO that curriculum as I see fit! So, I am creating a curriculum to use that will TEACH our daughter HOW TO STUDY THE BIBLE/ HAVE DEVOTIONS. Bible classes ARE counted as curriculum! They teach those CORE VALUES that our public schools CRY OUT FOR today, but are shoved out because of "Separation of Church & State!" Bible classes give that foundation for living, that standard by which to guide your life & WHY it should be so! And I can see using this curriculum in the ministry I feel being drawn to! I am using a book I asked "Santa" to get me for Christmas, Lord, Teach Me To Study The Bible In 28 Days, by Kay Arthur. (I used to listen to Kay on the radio back in the days I ran the kids back & forth to public school in our vehicle & I so enjoyed her ministry!) I AM planning to use another book I got back in college from our Campus Bookstore, Lord, I'm Listening by Donna Leonard. 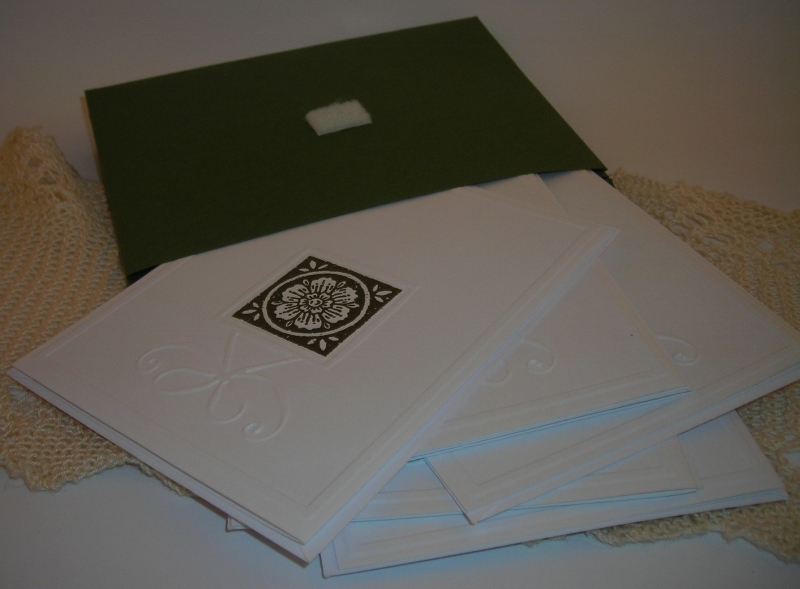 She teaches HOW to create a Devotional/Prayer Journal. I know those Devotional/Prayer Journals are VERY BIG these days. I've seen them already made too, but for SOOO MUCH LESS, you can CREATE YOUR OWN! These are tools that EVERY Christian NEEDS! As I read Kay's book, guess what the FIRST THING her book taught for the first principle?
" Listen to the word of the Lord, O sons of Israel, For the Lord has a case against the inhabitants of the land. Because there is no faithfulness or kindness Or knowledge of God in the land. There is swearing, deception, murder, stealing & adultery. They employ violence, so that bloodshed follows bloodshed. Therefore the land mourns, And everyone who lives in it languishes (look THAT word up!) Along with the beasts of the field & the birds of the sky, And also the fish of the sea disappear. My people are destroyed for lack of knowledge. Because you have rejected knowledge, I also will reject you from being My priest. Since you have forgotten the law of your God, I also will forget your children." Lord, I'm listening! And so, BECAUSE I KNOW I MUST OBEY GOD, make HIM MY FIRST PRIORITY, I feel I need to post less often! And even take a little different direction with my blog if necessary OR whether I'm to continue blogging at all. I also want to ENCOURAGE YOU to look at YOUR GOALS for the year & see it they line up with what God wants you to do! IF you feel as I do, feeling the need to study God's Word more & just not sure HOW to go about it, take a look at the books I've listed! The Quiet Place, by Nancy Leigh DeMoss-Christian Book Distributors (CBD) & Amazon. Lord Teach Me To Study The Bible in 28 Days, by Kay Arthur-Christian Book Distributors (CBD) & Amazon. Here are some CAS Thank You cards I created quite awhile back, Never Posted Before! I sent these to some friends that were so sweet in sending me a little something special for Christmas! They're SO SIMPLE that you not only can make them in a pinch but, you can make a set to give as a gift! 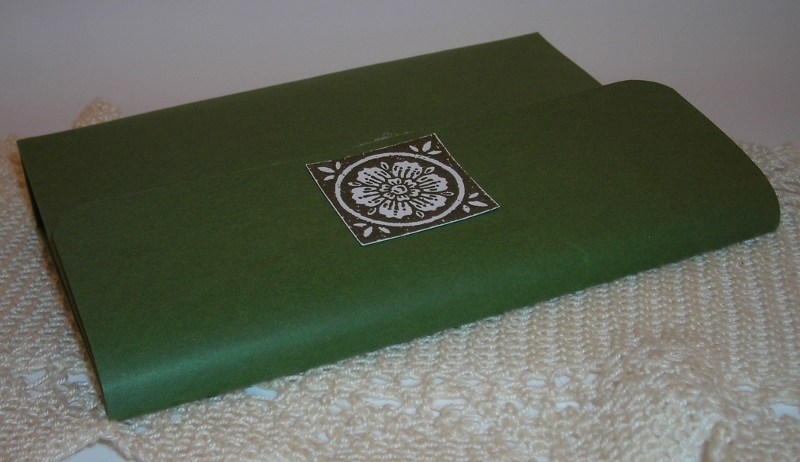 Here I made an envelope to hold the set of cards. The pattern is an old CHF pattern. It was/is to hold Post Cards. I was able to get six cards & envelopes into this matching Storage Envelope! DO keep me in your prayers as I am knocking on doors for reaching out & touching those locally! Pray that the Lord will have HIS WILL! That I will be OBEDIENT! That HE will BE GLORIFIED! That I will CONTINUE to learn ALL HE HAS FOR ME!